C1532. 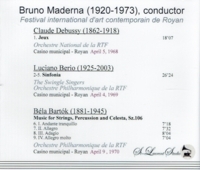 BRUNO MADERNA Cond. 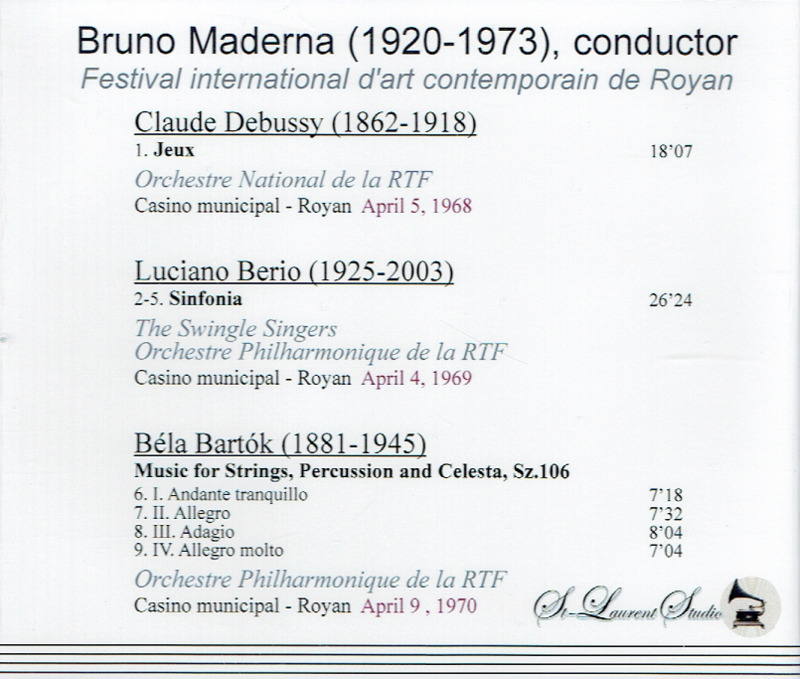 RTF S.O: Jeux (Debussy); Music for Strings, Percussion & Celesta (Bartok); w. The Swingle Singers: Sinfonia (Berio). (Canada) St Laurent Studio YSL T-469, Live Performances, 1968-70, Casino municipal, Royan. Transfers by Yves St Laurent. “A French vocal group famed for tackling all manner of classical material (Baroque, fugues, madrigals, orchestral overtures) and switching them to an a cappella swing setting, the Swingle Singers was formed in Paris during the early '60s by American expatriate Ward Swingle. By the time of their 1963 album debut, the group comprised eight voices - Swingle, Christiane Legrand (sister of Michel), Jean-Claude Briodin, Anne Germain, Claude Germaine, Jean Cussac, Claudine Meunier and Jeanette Baucomont. That album, ‘Jazz Sebastian Bach’ (titled ‘Bach's Greatest Hits in America’), earned the group a Grammy award and almost made the Top Ten. The novelty inherent in an eight-voice scatting choir resulted in dozens of television and radio appearances around the world during the mid-'60s. 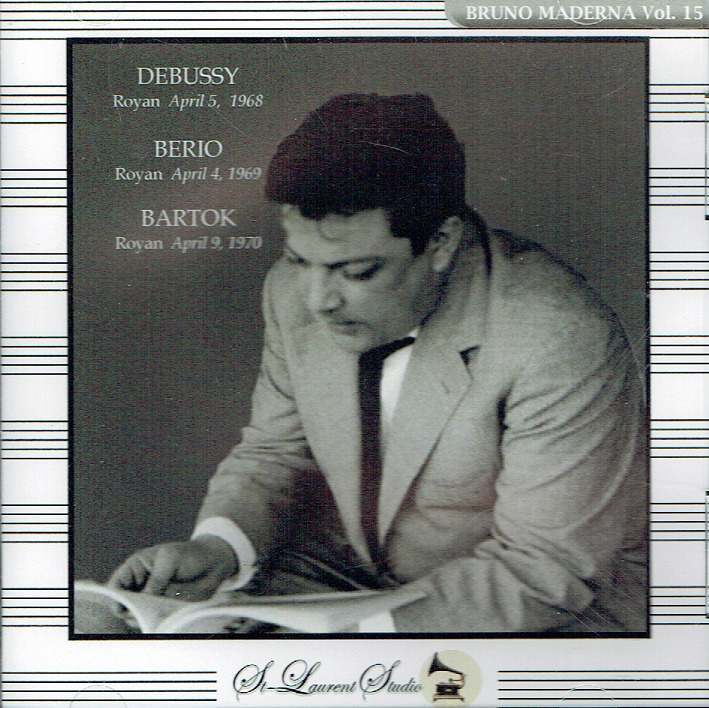 Somehow, the group also managed to record follow-up LPs Going Baroque in 1964 and ‘Anyone for Mozart?’ one year later. Both were Grammy winners as well - though Best Performance by a Chorus definitely wasn't the most competitive category at the awards ceremony. In an era when vocal choruses increasingly slipped down the ‘easy listening’ slope, however, the Swingle Singers moved in precisely the opposite direction. In 1969, a subsidiary group called ‘Swingles II’ premiered ‘Sinfonia’ [above], a composition by the avant-garde composer Luciano Berio that also utilized the New York Philharmonic.